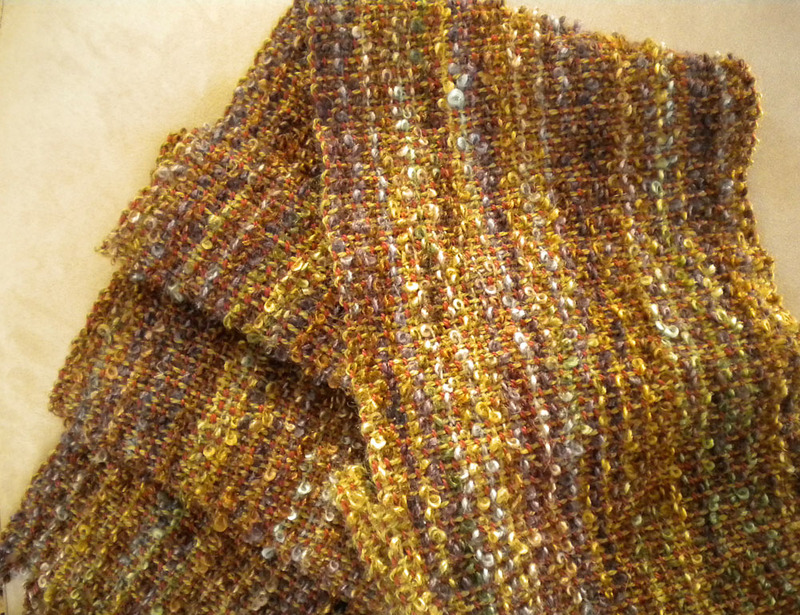 The next day when we got together, I launched in with my adventures weaving a mohair bouclé scarf. I usually weave with smooth, finer yarns and this mohair bouclé was a bit out of my comfort zone. (That’s three projects.) What happened to the spot bronson placemats? They are still in the planning stage. And the napkins are still on the loom, eight more to weave. It seems I’m always juggling projects, each one at a different stage. There’s the planning stage, then warping, active weaving, and finally finishing. The planning stage of a project takes lots of thought. 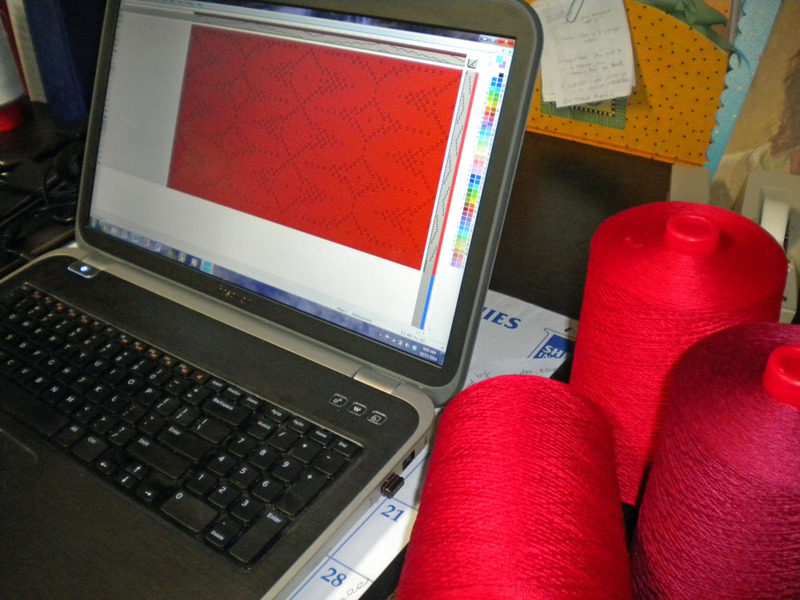 I mull over the colors, the pattern, the yarns sometimes for several days. Then one morning, it will pull together and the project is on its way. Usually while I’m pondering, I will be weaving or finishing something else. I learned this process from Anita Luvera Mayer, a weaving teacher and artist. She said to always have three things going at once: something being planned, something on the loom, and something in a basket waiting to be hemmed. There will always be something to do, no matter how much — or how little — time I have. If there’s only half an hour before an appointment, I can still pick up a needle and finish a hem. If I get stiff from weaving for a long period, I can get up and wind the next warp, a process that requires lots of arm movement to loosen me up. And sometimes it’s just nice to have something different to work on. It moves each project along and keeps my perspective fresh. This process works for me. What’s your process? Hmmm . . . hadn’t really thought about this. I do juggle projects but they tend to be in different media. I’m weaving some dishtowels and trying to get a quilt top basted, and developing some new chocolates for my Etsy shop. I love the look of your point twill napkins! Thanks! 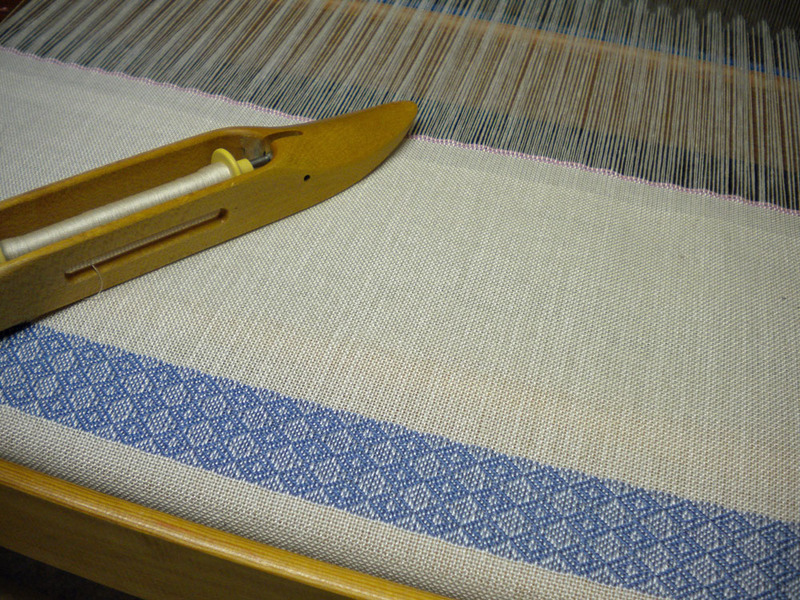 The plain weave background makes the twill pattern shine. What’s the name of your Etsy chocolate shop? Actually, it’s Kerrycan–I sell chocolates and vintage linens. Not sure if that makes sense but it works for me! Of course! I’m sorry–I thought the chocolates were in a separate shop but now I see them right there! And they look very inviting indeed!